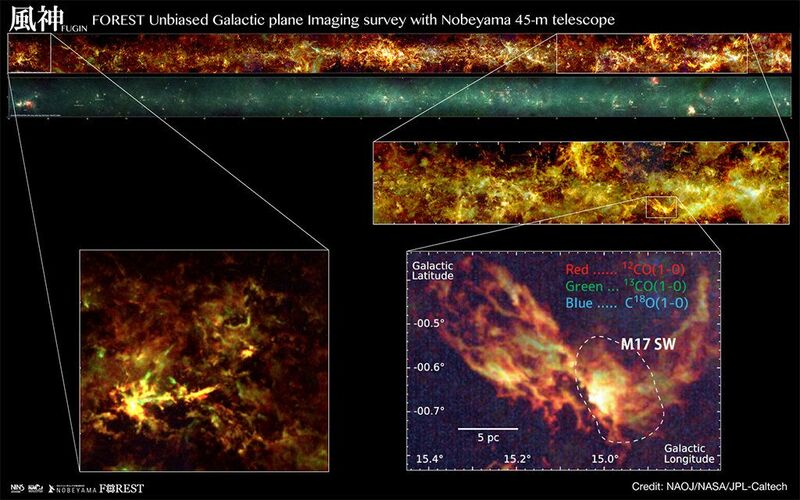 A Japanese telescope has produced our most detailed radio wave image yet of the Milky Way galaxy. Over a 3-year time period, the Nobeyama 45 meter telescope observed the Milky Way for 1100 hours to produce the map. 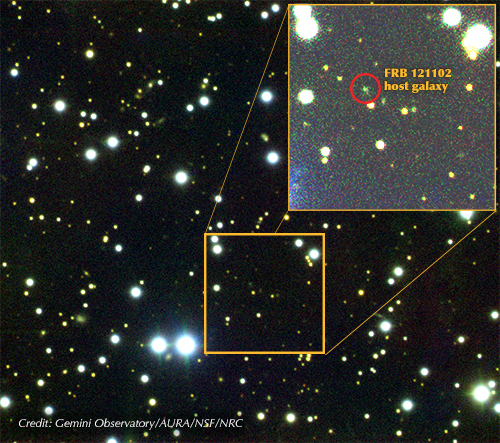 The image is part of a project called FUGIN (FOREST Unbiased Galactic plane Imaging survey with the Nobeyama 45-m telescope.) The multi-institutional research group behind FUGIN explained the project in the Publications of the Astronomical Society of Japan and at arXiv. The Nobeyama 45 meter telescope is located at the Nobeyama Radio Observatory, near Minamimaki, Japan. The telescope has been in operation there since 1982, and has made many contributions to millimeter-wave radio astronomy in its life. This map was made using the new FOREST receiver installed on the telescope. When we look up at the Milky Way, an abundance of stars and gas and dust is visible. But there are also dark spots, which look like voids. But they’re not voids; they’re cold clouds of molecular gas that don’t emit visible light. To see what’s happening in these dark clouds requires radio telescopes like the Nobeyama. The Nobeyama was the largest millimeter-wave radio telescope in the world when it began operation, and it has always had great resolution. But the new FOREST receiver has improved the telescope’s spatial resolution ten-fold. The increased power of the new receiver allowed astronomers to create this new map. The new map covers an area of the night sky as wide as 520 full Moons. The detail of this new map will allow astronomers to study both large-scale and small-scale structures in new detail. FUGIN will provide new data on large structures like the spiral arms—and even the entire Milky Way itself—down to smaller structures like individual molecular cloud cores. FUGIN is one of the legacy projects for the Nobeyama. These projects are designed to collect fundamental data for next-generation studies. To collect this data, FUGIN observed an area covering 130 square degrees, which is over 80% of the area between galactic latitudes -1 and +1 degrees and galactic longitudes from 10 to 50 degrees and from 198 to 236 degrees. Basically, the map tried to cover the 1st and 3rd quadrants of the galaxy, to capture the spiral arms, bar structure, and the molecular gas ring. The aim of FUGIN is to investigate physical properties of diffuse and dense molecular gas in the galaxy. It does this by simultaneously gathering data on three carbon dioxide isotopes: 2CO, 13CO, and 18CO. Researchers were able to study the distribution and the motion of the gas, and also the physical characteristics like temperature and density. And the studying has already paid off. FUGIN has already revealed things previously hidden. They include entangled filaments that weren’t obvious in previous surveys, as well as both wide-field and detailed structures of molecular clouds. Large scale kinematics of molecular gas such as spiral arms were also observed. But the main purpose is to provide a rich data-set for future work by other telescopes. These include other radio telescopes like ALMA, but also telescopes operating in the infrared and other wavelengths. This will begin once the FUGIN data is released in June, 2018. Millimeter wave radio astronomy is powerful because it can “see” things in space that other telescopes can’t. It’s especially useful for studying the large, cold gas clouds where stars form. These clouds are as cold as -262C (-440F.) At temperatures that low, optical scopes can’t see them, unless a bright star is shining behind them. Even at these extremely low temperatures, there are chemical reactions occurring. This produces molecules like carbon monoxide, which was a focus of the FUGIN project, but also others like formaldehyde, ethyl alcohol, and methyl alcohol. These molecules emit radio waves in the millimeter range, which radio telescopes like the Nobeyama can detect. This new map from the Nobeyama holds a lot of promise. A rich data-set like this will be an important piece of the galactic puzzle for years to come. The details revealed in the map will help astronomers tease out more detail on the structures of gas clouds, how they interact with other structures, and how stars form from these clouds. On October 19th, 2017, the Panoramic Survey Telescope and Rapid Response System-1 (Pan-STARRS-1) in Hawaii announced the first-ever detection of an interstellar asteroid, named 1I/2017 U1 (aka. ‘Oumuamua). Based on subsequent measurements of its shape (highly elongated and thin), there was some speculation that it might actually be an interstellar spacecraft (the name “Rama” ring a bell?). For this reason, there are those who would like to study this object before it heads back out into interstellar space. While groups like Project Lyra propose sending a mission to rendezvous with it, Breakthrough Initiatives (BI) also announced its plans to study the object using Breakthrough Listen. As part of its mission to search for extra-terrestrial communications, this project will use the Greenbank Radio Telescope to listen to ‘Oumuamua for signs of radio transmissions. Observations of ‘Oumuamua’s orbit revealed that it made its closest pass to our Sun back in September of 2017, and has been on its way back to interstellar space ever since. When it was observed back in October, it was passing Earth at a distance of about 85 times the distance between Earth and the Moon, and was traveling at a peak velocity of about 315,430 km/h (196,000 mph). This indicated that, unlike the many Near-Earth Objects (NEOs) that periodically cross Earth’s orbit, this asteroid was not gravitationally bound to the Sun. In November, astronomers using the ESO’s Very Large Telescope (VLT) at the Paranal Observatory in Chile were also able to determine the brightness and color of the asteroid, which allowed for precise calculations of its size and shape. Basically, they determined that it was 400 meters (1312 ft) long and very narrow, indicating that it was shaped somewhat like a cigar. What’s more, the idea of a cigar or needle-shaped spacecraft is a time-honored concept when it comes to science fiction and space exploration. Such a ship would minimize friction and damage from interstellar gas and dust, and could rotate to provide artificial gravity. For all of these reasons, it is understandable why some responded to news of this asteroid by making comparisons to a certain science fiction novel. That would be Arthur C. Clarke’s Rendezvous with Rama, a story of a cylindrical space ship that travels through the Solar System while on its way to another star. While a natural origin is the more likely scenario, there is no consensus on what the origin this object might be – other than the theory that it came from the direction of Vega. Hence why Breakthrough Listen intends to explore ‘Oumuamua to determine whether it is truly an asteroid or an artifact. Established in January of 2016, Listen is the largest scientific research program aimed at finding evidence of extra-terrestrial intelligence with established SETI methods. These include using radio observatories to survey 1,000,000 of the closest stars (and 100 of the closest galaxies) to Earth over the course of ten years. 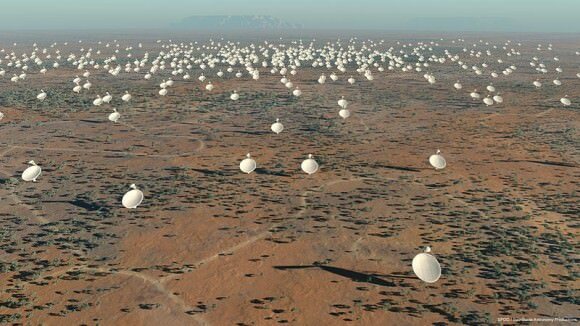 Listen’s observation campaign will begin on Wednesday, December 13th, at 3:00 pm EST (12:00 PST), using the Greenbank Radio Telescope. This 100-meter telescope is the world’s premiere single-dish radio telescope and is capable of operating at millimeter and submillimeter wavelengths. It is also the mainstay of the NSF-funded Green Bank Observatory, located in West Virginia. Still, I think we can all agree that an extra-terrestrial spaceship would be the most exciting possibility (and perhaps the most frightening!). And it is very safe to say that some of us will be awaiting the results of the survey with baited breath. Luckily, we’ll only have to wait two more days to see if humanity is still alone in the Universe or not! Stay tuned!